Cimarron's Derek Morefield (5) loses the ball after being tackled by Centennial defenders on Thursday. 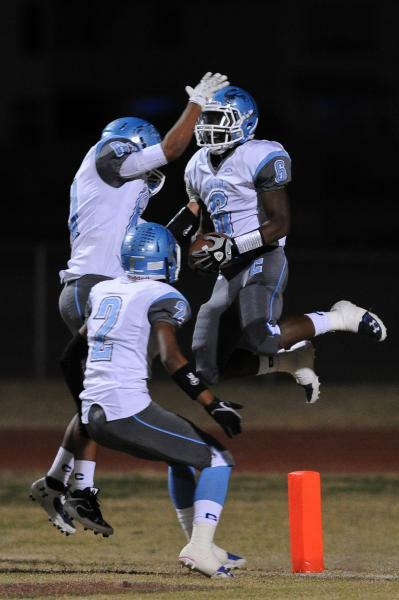 Centennial's Lantz Worthington (6) celebrates with his teammates after scoring a touchdown on Thursday. The Bulldogs beat Cimarron-Memorial, 20-0. Cimarron's Derek Morefield (5) is brought down by a host of Centennial defenders including Andre Diller (85) on Thursday. 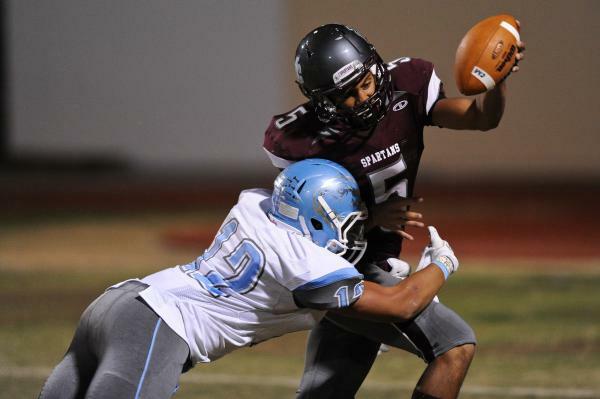 Cimarron's Derek Morefield (5) is wrapped up by Centennial's Izaias Jackson (12) on Thursday. 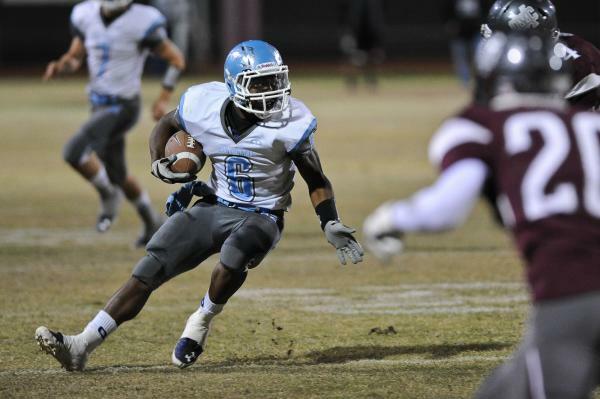 Centennial's Lantz Worthington (6) looks for running room against Cimarron on Thursday. Centennial's Lantz Worthington (6) races past Cimarron defender Savigon McIver (20) for a touchdown during the Bulldogs' 20-0 win over the Spartans. 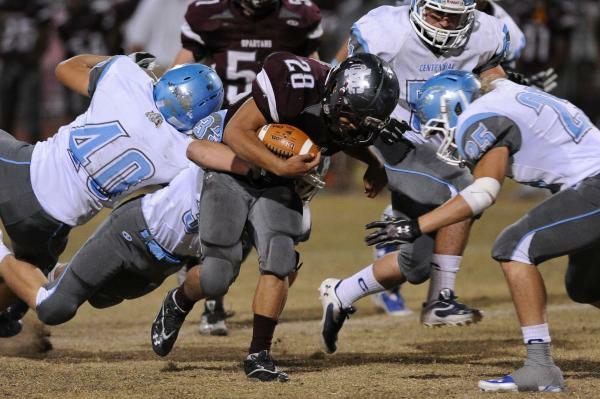 Cimarron's Michael Barnson (28) runs into Centennial's Austin Schulter (25) on Thursday. Centennial's defense was stout in a 20-0 win. Centennial's Izaias Jackson (12) is congratulated by Nicholas Humenik after an interception during the team's 20-0 win over Cimarron-Memorial. 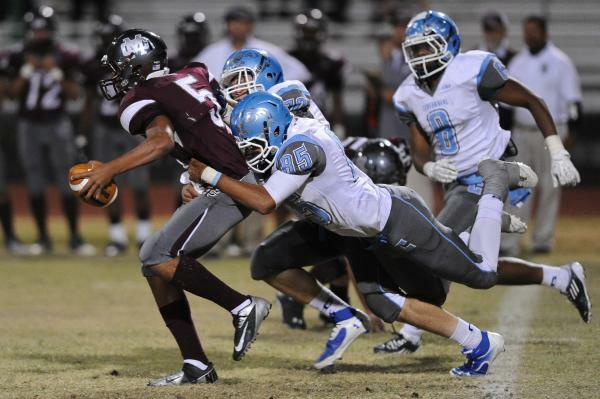 Cimarron's Derek Morefield (5) looks for running room around Centennial's Andre Diller (85) on Thursday. 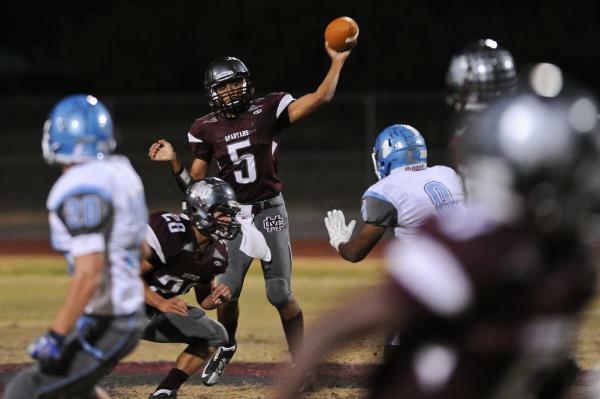 Cimarron's Derek Morefield (5) looks to throw the ball Thursday against Centennial. Centennial’s offense ran just 36 plays and had trouble picking up yards for much of Thursday night’s game at No. 10 Cimarron-Memorial. The unit probably just could have taken the night off the way the defense was playing. Centennial’s defensive front controlled the line of scrimmage from start to finish as the Bulldogs earned a 20-0 road victory. Haley returned an interception 59 yards for a score in the third quarter, providing more than enough scoring for the Bulldogs. 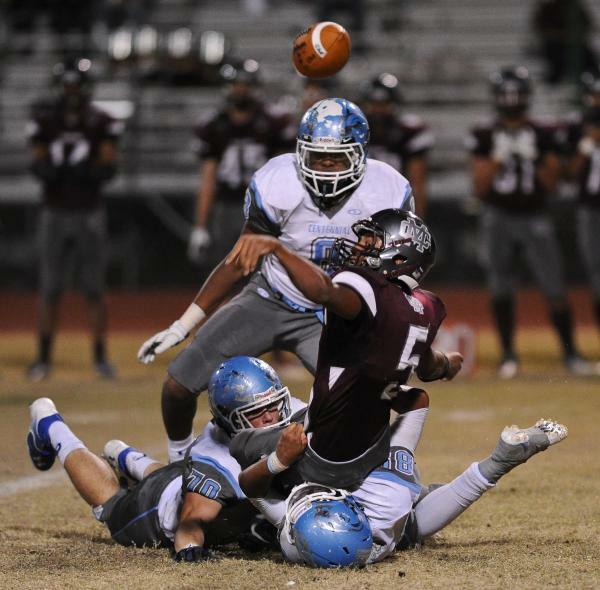 Centennial (4-3, 3-0 Southwest League) forced five turnovers and sacked Cimarron quarterback Derek Morefield four times. Morefield was on the run virtually every time he dropped back to pass. “My hat’s off to (defensive coordinator Devan) Jones and his staff. 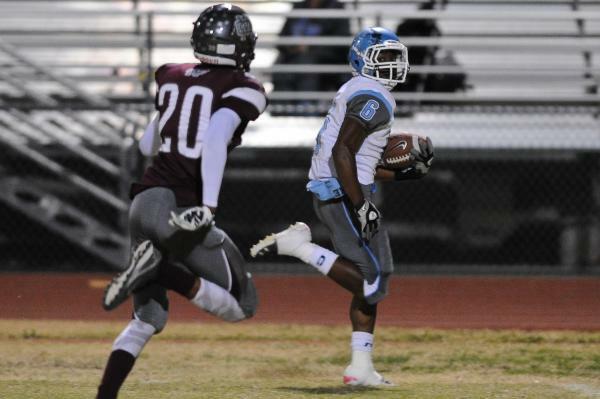 They did a great job preparing our kids for this ball game,” Centennial coach Leon Evans said. “They knew how important it was as far as our playoff hunt. That third quarter we had every flag in the book thrown at us and they still just kept battling and kept pushing back, and those guys did an outstanding job of not letting them score. Cimarron (5-2, 1-2) never could get its rushing attack going. Michael Barnson finished with 112 yards, but it took 35 carries to get there. He entered the game averaging more than 6 yards per attempt. Most of Morefield’s 120 passing yards came in the fourth quarter when the game was out of reach. He finished 12 of 27 and was intercepted four times. Lantz Worthington provided most of the offense for the Bulldogs. The senior running back rushed for 93 yards on 12 carries, with most of the damage coming on a 47-yard touchdown run to open the scoring in the first quarter. Those would be the only points of the opening half. Cimarron got the ball first after halftime but lost 8 yards on the first play before Morefield was sacked at the 1-yard line on second down. After a short gain and a short punt, Centennial took advantage of the good field position as quarterback Coll Thomson ran for a TD from 2 yards out. It was more than enough for the dominant Bulldogs defense. Haley ran back the interception a few minutes later to cap the scoring and give Centennial its third straight victory. Legacy 49, Desert Oasis 21 — At Desert Oasis, Legacy’s DeMichael Walker ran for 193 yards and four touchdowns on 17 carries to lead the Longhorns (5-2, 2-1 Southwest) past the Diamondbacks. Walker carried most of the load offensively after Casey Hughes left the game with an injured neck. Hughes is expected to be back for next week’s game against Cimarron-Memorial. The Longhorns jumped to a 21-0 first quarter lead on scoring runs by Hughes, Walker and Cody Polvado. Desert Oasis (3-4, 0-3) rallied in the second quarter, scoring on a 29-yard run by Jocquez Kalili and a 28-yard touchdown pass from Richie Stammetti to Gary Abdella. Walker scored the second of his touchdowns on an 11-yard run, and the Longhorns led 28-14 at the half. The Longhorns put away the game when Walker broke free on a 73-yard touchdown run for a 42-21 fourth-quarter lead. Liberty 63, Basic 42 — At Liberty, Tyler Newman completed 27 of 35 passes for 414 yards and five touchdowns to help the Patriots pull away late. The teams traded touchdowns in the opening minutes, and Basic and took a 21-14 lead on a 9-yard pass from Antraye Johnson to David Garza with 5:18 left in the second quarter. Chris Reed caught six passes for 108 yards for No. 4 Liberty (6-3, 4-0 Southeast), and Johnson carried 22 times for 144 yards and two touchdowns for Basic (3-5, 2-2). Arbor View 51, Shadow Ridge 7 — At Arbor View, senior Salah Boyce caught two touchdown passes, returned a fumble for a score and intercepted a pass to lead the Aggies to a win over neighborhood rival Shadow Ridge. Boyce’s 60-yard touchdown reception from senior quarterback Andrew Cornwell helped the No. 5 Aggies (6-1, 3-0 Northwest) to a 24-0 lead with 7:06 left in the first half. Then, moments after tipping the ball to himself in the end zone for a 6-yard touchdown catch in the fourth quarter, Boyce scooped up Xavier Flores’ fumble at the 12-yard line and raced toward the right corner of the end zone to put the game well out of reach, 44-7. Senior Anthony Smith rushed for 152 yards on 10 carries, including a 58-yard TD run, while junior Herman Gray ran for 120 yards on 11 attempts and had a 33-yard TD scamper for Arbor View. The Aggies used 11 rushers to finish with 382 yards on the ground. Cornwell finished completed two passes, both scoring strikes to Boyce, for 66 yards. Shadow Ridge (3-4, 1-2) was led by seniors Cody Alfar, who ran for 95 yards on 12 carries, and Dustin Puia, who completed nine passes for 114 yards, including a 30-yard touchdown to senior J Henderson. The Aggies dedicated the game to the school’s former principal, Pat Hayden, who died last Saturday. 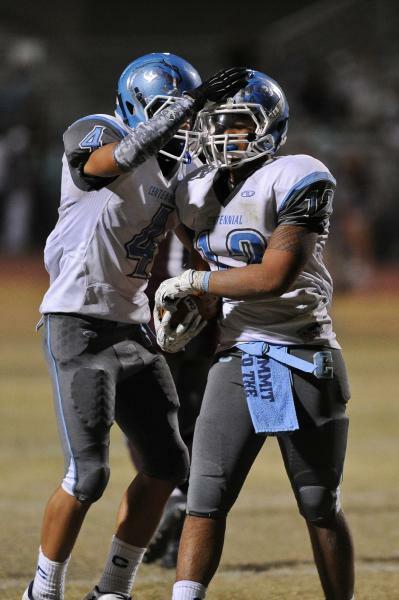 Las Vegas 59, Valley 14 — At Valley, Andrew Moreland ran for 83 yards and three touchdowns to lead the No. 7 Wildcats. Moreland started with a 45-yard scamper on the third play from scrimmage to open the scoring and added a 6-yard run with 2:44 left in the quarter. After a Valley punt, Moreland raced 18 yards to the end zone to make it 28-7 early in the second quarter. No. 7 Las Vegas (5-3, 3-1 Northeast) went running back by committee during the second half. Jovan Seals put up 49 yards on seven carries, Elias Miller added 65 yards on three carries including a 47-yard touchdown, and Keoni Running rushed for 58 yards on four carries with a 40-yard touchdown run. Valley’s Ray Tyler led all rushers with 147 yards on 13 carries. Tyler kept the game close in the first quarter as he bolted for an 82-yard run to make it 14-7. Las Vegas gained 416 yards of offense and allowed Valley (1-7, 0-4) just 37 yards in the second half after giving up 168 yards in the first. The Wildcats also picked off Valley quarterback Tyrone Prewitt three times, with Sean Randall returning one of them for an 11-yard score. Spring Valley 24, Durango 15 — At Spring Valley, Michael Bianco rushed for 62 yards on 10 carries and scored the go-ahead touchdown for the Grizzles (2-5, 1-2 Northwest). Defense and special teams carried Spring Valley for much of the game. Logan Cruz returned an interception 37 yards before halftime, and Dylan Clifton recovered a blocked punt in the end zone for a score. Bianco punched it in from 6 yards out to cap a nine-play drive to begin the fourth quarter. Joseph Padfield’s 35-yard field goal put the game out of reach. Leontre Austin started the game with an 80-yard dash for a touchdown for Durango (0-7, 0-3) , but was contained to just nine carries for 27 yards the rest of the game. Ben Hayden went 10-of-19 for 140 yards and found Caleb Booze for a 65 yard touchdown, but Hayden threw three interceptions and was sacked five times. Bishop Gorman 79, Bonanza 0 — At Bonanza, Randall Cunningham threw two touchdown passes and ran for another score as the top-ranked Gaels (8-2, 5-0 Southwest) overwhelmed the Bengals (3-5, 1-3). Russell Booze had four carries for 85 yards in the first quarter, including scores of 42 and 20 yards to lead the Gorman ground attack. Bonanza’s Carlos Soto racked up 88 yards on kickoff returns, and Devin Hosey hauled in a 39-yard catch from quarterback Tyler Penkalski. Palo Verde 54, Sierra Vista 0 — At Sierra Vista, Parker Rost hooked up with Jake Ortale for back-to-back scores to start the game, and Palo Verde (6-1, 3-0 Northwest) never looked back. Foothill 42, Eldorado 18 — At Eldorado, Drew Doxtator passed for 322 yards and five touchdowns to lead the Falcons over the Sundevils. Bobby Merritt returned the opening kickoff 80 yards for a touchdown for the Falcons. Eldorado quarterback Matthew VanOrden passed for 313 yards and two scores, including a 58-yard touchdown pass to Joshua Brown in the third quarter. Boulder City 14, Chaparral 8 — At Chaparral, Trenton Carmell capped a 90-yard drive with a 1-yard run in the third quarter that proved to be the game winner as the Eagles grabbed the final postseason berth from the I-A Sunrise League. The Eagles went 15 plays in just more than eight minutes for the lone second-half score. Boulder City relied on its defense the rest of the way, forcing Chaparral quarterback Jerome Williamson to throw eight straight incompletions. In addition, Williamson was sacked three times in the fourth quarter. In the first half, the Eagles (4-5, 2-4) had the ball for nearly 17 minutes but managed a single score, an 8-yard run from Brooks Roe and an 8-0 lead. Chaparral answered with its only scoring drive, 44 yards in eight plays capped by Richard Hernandez’s 9-yard TD. Boulder City finished with 287 yards, all on the ground. Xavier Steel led the way for the Eagles with 93 yards on 13 carries while Hernandez added 86 on 17 and Roe with 77 on 11. Chaparral (3-6, 1-5 ) had just 61 yards on the ground, and Williamson completed just five of 17 passes for 70 yards. Silverado 58, Rancho 0 — At Silverado, Jarrett Alipio rushed for a touchdown and caught a scoring pass as the Skyhawks clinched a playoff berth. Coronado 43, Del Sol 8 — At Coronado, John Farella scored three times in the first quarter — two passing, one rushing — to help the Cougars beat the Dragons. Clark 44 Cheyenne 20 — At Clark, Kareem Warren ran for three second-quarter touchdowns to lead the Chargers into the playoffs for the first time in nine years. Cheyenne led 8-0 after the first quarter and trailed 22-14 at the half because of Warren’s efforts. He followed up his second quarter with a 22-yard scoring pass to Marquice Stuart and touchdown runs of 3 and 10 yards. He finished with 213 yards passing and 80 yards rushing. The Chargers improved to 4-5, 2-3 in Division I-A Sunset. Jordan Johnson finished with 80 yards rushing for Cheyenne (2-7, 2-3). Faith Lutheran 53, Western 6 — At Faith Lutheran, the Crusaders won their eighth straight game heading into the playoffs, notching 28 points in the first quarter. The Crusaders (8-2, 5-0 Division I-A Sunset) got 103 yards rushing and 122 yards passing from quarterback Jake Deaville. Fabian Lagudi scored twice. Trenton Dolby accounted for 15 Faith points, scoring on a reception, a field goal and six PATs. Vinny DeGeorge had a 60-yard TD reception. Robbie Schwarz rushed for 68 yards on 12 carries. Western was led by Xerexes Tachiquin, who scored on an 89-yard kickoff return and rushed for 30 yards on 12 carries. Faith outgained Western in total offense, 414-29. The Crusaders began to pull the first string in the second quarter, and Western allowed Faith’s special needs senior Clayton Rhodes to rush for a 2-point conversion. Virgin Valley 60, Sunrise Mountain 28 — At Sunrise Mountain, Garrett Leavitt threw for 197 yards and four touchdowns in the first half as the Bulldogs rolled past the Miners. Mountain View 34, Needles (Calif.) 7 — At Mountain View, Ian Locke threw three touchdown passes and the Saints rushed for 306 yards as Mountain View clinched a share of the Division III Southern League championship. The Saints trailed, 7-0, late in the first quarter after Kobee McCorkle’s 11-yard run. The Mustangs, however, gained just 35 yards in the final three quarters. Mountain View (7-1, 6-0 Division III Southern), which opened by taking its first two possessions deep into Needles territory but scoring no points, exploded during the second quarter. Locke touchdown passes of 1 and 39 yards to Noah Van Kempen as the Saints scored 22 points. Jacob Duldulao added a 20-yard scoring run for the Saints, who gained 128 yards during the quarter. Locke hit Travis Wallace for a 24-yard score in the third, and Matthew Larson added a 4-yard touchdown run to close the scoring. Larson led the Saints with 105 yards on 23 carries, while sophomore Bernard Williams added 92 on 12 tries. Duldulao finished with 70 yards on 11 carries before leaving the game with cramps late in the third period. McCorkle had 38 of Needles’ (5-3, 4-2 Division III Southern) 52 rushing yards. Agassi Prep 40, White Pine 0 — At Rancho, sophomore quarterback Stephan Laushaul ran for 137 yards and touchdowns of 52, 13 and 26 yards to lead the Stars to a decisive victory. Agassi Prep (6-3, 4-3 Division III Southern) took control on its first possession, driving 58 yards on six plays culminating in a 2-yard touchdown run by junior running back Steven Jones. This was followed by Laushaul’s first touchdown of the game. White Pine (0-9, 0-7) was forced to punt on each of its first-half possessions. Junior running back Kobe Williams, who rushed for 89 yards, scored on a 41-yard touchdown run to give the Stars a 20-0 halftime advantage. Dakota Barela led the Bobcats with 44 rushing yards. Moapa Valley 27, Desert Pines 13 — At Overton, Kaleb Bodily ran for 172 yards and two touchdowns on 22 carries, and the No. 9 Pirates built a 14-0 lead before the Jaguars even touched the ball in the showdown for the Division I-A Sunrise League title. Mojave 47, Pahrump Valley 0 — At Pahrump, Ty Flanagan ran for 143 yards and three touchdowns on 10 carries as the Rattlers clinched the No. 2 seed from the Division I-A Sunset League. Daijon Williams-Smith moved up from junior varsity and rushed for 102 yards and a touchdown and added 47 yards receiving for Mojave (6-3, 4-1 Sunset). Elijah Smoot had 67 yards and a TD on five carries. Kaleb Friedman led the Rattlers defense with a 72-yard interception return for a score and 13 tackles. Deair Howell also had an interception for Mojave. With the loss, Pahrump (3-6, 2-3) fell into a three-way tie for third place with Clark and Cheyenne. Indian Springs 35, Tonopah 20 — At Indian Springs, Mason Hamlin rushed for 282 yards and two touchdowns and returned a punt 65 yards for a score as the Thunderbirds (5-3, 4-2 Division IV Southern) scored 23 unanswered points to knock off the Muckers (5-3, 4-1). Troy Heath added 69 yards rushing and scored two second-half TDs for Indian Springs, which trailed 20-12 at halftime. Connor Friel had two touchdowns, one rushing and one receiving, for Tonopah. Sandy Valley 28, Beatty 15 — At Beatty, James Rau caught two touchdowns from Lane Eastham and added an 80-yard TD run as the Sidewinders (4-4, 1-4 Division IV Southern) defeated the Hornets (2-4, 1-4). Eastham also had a touchdown run for Sandy Valley. Spring Mountain 62, Round Mountain 0 — At Spring Mountain, George Brown returned two fumbles for touchdowns, and eight Golden Eagles scored in a rout of the Knights. Brown’s 36-yard fumble return with 12 seconds to go in the first half highlighted a flurry of scoring to close the second quarter. Spring Mountain led 22-0 at the end of the first quarter but was held scoreless for the first 11:31 of the second. But Joshua Banasiak hit Isaiah Saromines with an 11-yard TD pass with 29 seconds to go in the half, and Brown’s fumble return put the Golden Eagles up 34-0 at the break. Banasiak tossed an 11-yard TD pass to Valmir Bojku, and the quarterback added a 1-yard TD run for Spring Mountain (4-2, 3-2 Division IV Southern). Round Mountain fell to 1-7, 0-4.